Next Level AssetsLocation, Location, Location – What Does It Mean? The age-old mantra in real estate investing is “location, location, location!” So, what does that really mean to you? And what do you do about it? 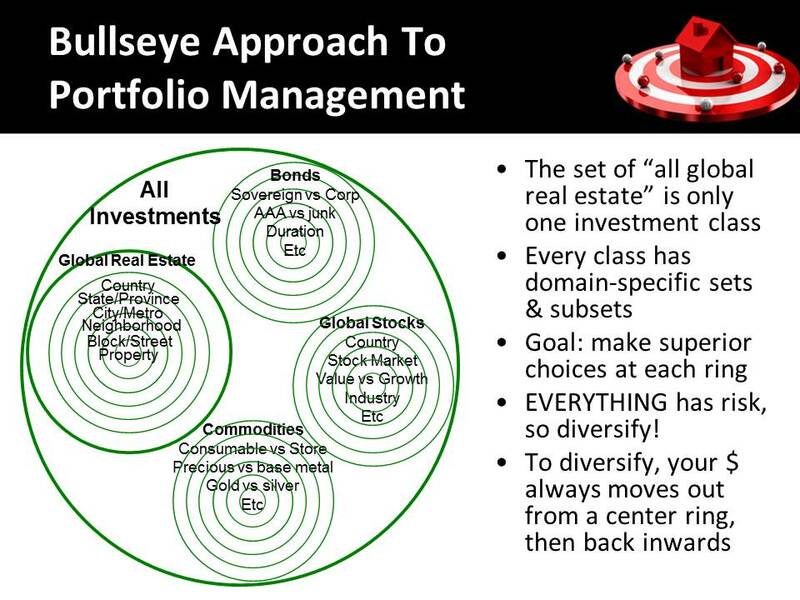 At Next Level Assets, we use a “Bull’s Eye” approach to achieving this mantra, which combines mathematical set theory with competitive analysis. The “Property” ring/set contains one property, the “State” ring/set contains all properties in a state or province, the “Country” ring/set contains all the properties in a country, etc. We look at every ring of the bull’s eye because picking every one well is a key aspect in maximizing long-term REI returns at minimal risk. Our goal is to ensure every ring containing our target property has strong and sustainable competitive advantages against properties outside that ring - this will lead to yield and value increases for everything inside “our" ring. 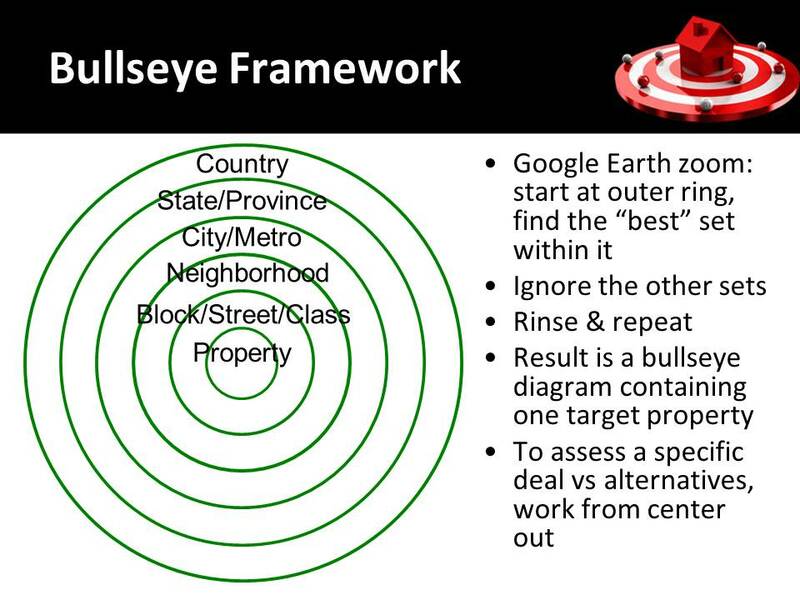 Every ring of the bull’s eye involves a different kind of analysis, different opportunities & risks, different facts to check, and has a different impact on a project’s ultimate returns. Most investors start locally, so the outer 3 rings are set by default, and they only consider the inner 3 rings. This may bring comfort and control, but it limits upside and concentrates catastrophic financial risk (such as Californians investing in the same earthquake zone where they live). The Internet has vastly transformed our ability to assess every ring remotely. An investor may venture to a different metro they can drive to, or go out of state via turnkey rentals or commercial syndications. In doing so, they put more trust in their teams on the ground that maintain intimate contact with the inner rings, and they engage their own ability to assess the outer rings well or work with experts who can. With the right relationships and some online effort, investors can spread their nest egg among several disparate locations to diversify risk, while ensuring each investment scores very high competitively at every ring of the bulls eye. Even investing outside the US is no different, it just adds one more ring. So, what are we seeing now? By extension, add two more outer rings: “world” (all properties in the world), and “Investments” (all possible investments in the world, of which real estate is only one). Then consider how diversified you are! We are intimately familiar with one of the top-performing metros in the nation in all economic respects, DFW TX. While classically a yield market more than appreciation, we see (and own) assets there worth twice their market value at the “peak of the market” in 2007 - while real tenant incomes have not risen. As owners we love that, but as syndicators we don’t: when even Class C multifamily sells at 7.5% caps for performing, we have trouble finding deals offering high upside without high risk. And we wonder how long rents and values can increase when tenant incomes aren't? Or when the next overbuilding cycle will happen in DFW as it always has? DFW already leads the nation in apartment construction as of Q2 2015. This cap rate compression in primary markets is driving investors to secondary markets and thinner, riskier deals that pencil out only when financed with low-interest rate debt at high occupancy - which may not exist come balloon time. It tells us the risk/reward ratio has shifted in the US “Country” ring due to Fed-induced asset value inflation. In addition, foreign investors are driving up pricing for high-quality US assets despite a strong dollar - generally a sign of an impending top. If US rate increases are gradual and synced with job & wage growth the party can continue, but if there is a glitch in rates or any other major macroeconomic expectation, US asset values could be hit. To enable REI portfolio diversification against this type of market risk (say another 2008, that we already know can happen), we have looked beyond the “State” ring to other stable nations that still clearly offer undervalued real estate and competitive advantages. This can occur due to lack of financing availability, high interest rates, and lack of a proper transaction market to match buyers/sellers or enable price discovery - the opposite of the US situation, a disparity which cannot last forever. For 2015, we have found several A+/5-Star properties in Costa Rica with extremely strong competitive barriers in every ring of the bulls eye, and as a result we expect they will outperform in nearly any economic scenario.